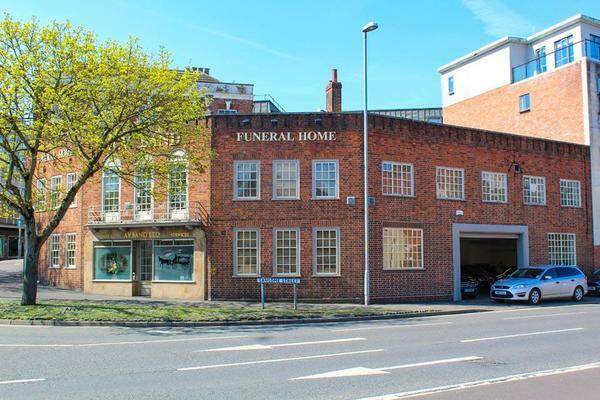 We are A V Band Funeral Directors in Worcester, and we are based in a beautiful building with golden lettering on our frontage, in the heart of the town centre. Our funeral directors are well known and valued as part of our Worcester community, because of the caring nature of our team and the impeccable standards of funerals we conduct. Our funeral home has recently been refurbished with the best facilities to help you feel at ease when you visit us. We have three private, comfortable chapels of rest where you may spend as much time as you wish with your loved one before the funeral. We can arrange all kinds of funerals, and will listen to your thoughts and wishes with compassion and integrity. We will make sure every detail is unique and meaningful to you, your family, and your loved one. Please get in touch at any time; we are always here to assist you. Call us today on 01905 22892 to talk through your personal requirements. At A V Band Funeral Directors, we understand how special life is with those that you love. For us, every funeral is unique and personal. We have a service to fulfil every wish, with every detail carried out with the same uncompromising quality of care. From a traditional service, to a colourful woodland burial, your options are limitless with our Full Service Funeral. If you have a little more flexibility when it comes to arrangements, then we can provide a Simple Funeral for a lower cost. We are on the corner where St Nicholas Street meets Sansome Street, with two large trees in front of our funeral home. Our staff are available 24 hours a day on 01905 22892 if you require our services outside of these hours. No problems at all. The funeral was carried out with respect and dignity by George who was in charge, and we cannot praise Jackie highly enough. She was brilliant. Dignified yet kind,friendly, and aiming to please and to meet our wishes. We found all staff, particularly Darren and George, so helpful and ready to offer suggestions. They were quick to offer ideas and to help us draw up a plan that was just what we wanted. Many at the service told us they thought it was ‘perfect’. We thought so too. I would recommend this firm to friends and family should they be looking for such a service. Darren, George and the team were absolutely amazing. They were professional throughout, and looked after us and dad with the up most respect. We couldn't of asked for better for our dad on his final journey. We have received your online review. I am pleased that you were so well looked after by our team and that the arrangements for your Father were carried out to your satisfaction. A V Band were absolutely brilliant, at a time when you need help support and guidance they were there for us. Jackie could not have done more down to arranging for Pip to officiate at the service, everyone commented on what a lovely service it was. On the day Darren and his staff acted with such dignity and the day went like clockwork. I wouldn't hesitate to recommend then anyone. Thank you for taking the time to complete the online review. I am pleased that we provided the highest level of care and guidance to you and your family, and that all of your wishes and requirements were carried out by the team as you had requested. I have been very happy with the service, very friendly and understanding your needs. I would be happy to recommend them to anyone. A V Band were brilliant throughout their service to me and our family when my husband sadly passed away. From our first point of contact through to the funeral day and beyond they have been helpful, professional and supportive through a very difficult time. Thank you for the kind comments posted on your online review. I am pleased that you were so well looked after by our team and that we were able to provide you with the support and guidance needed at such a difficult time. The service provided was excellent, very professional yet friendly. Great attention was given to detail & nothing was too much trouble, which ensured that the funeral went exactly as planned.Everyone was helpful & empathetic which was greatly appreciated during an extremely stressful time. The support and guidance I received was exceptional. There was no pressure to purchase more than you wanted and I was helped every step of the way to plan the service. Thank you for sharing your experience with us on your online review. I am pleased that we provided the highest level of care and guidance throughout the arrangements. Thank you for the kind comments posted on your online review. I am pleased that you were so well looked after by our team and that the arrangements and wishes for your husband were carried out to your satisfaction. All the staff, and especially Bev and Jackie, at A V Band showed such kindness and empathy to us and helped us through all the stages which are required at a time when your brain is not working as it should. Their guidance and care gave my Mum a personal, warm and loving service which has left us with such pleasurable memories rather than one of deep sadness. Thank you for the kind comments posted on your online review. I am glad that all of your wishes and requirements were carried out by the team as you had requested and that we were able to look after you and your family at this difficult time. Faultless, helped make a dreadful time easier to get through. Thank you for completing the online review. I am pleased that we were able to help make things easier for you at such a difficult time.